Large diversion arrows at the rear. Tilting hopper. Safety bars are folded down. 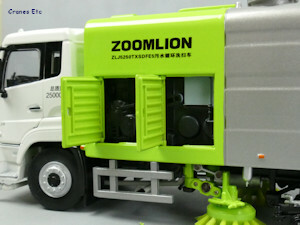 The Zoomlion ZLJ5250TXSDFE5 Cleaning Sweeper is mounted on a Dongfeng chassis. 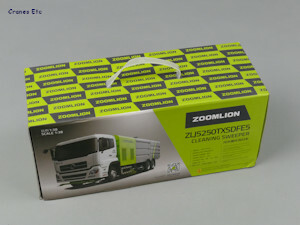 The model comes in a Zoomlion branded box with a carry handle and inside it, the model is contained within plastic formers. The review model had no defects or missing parts. A pointer is included with the model. 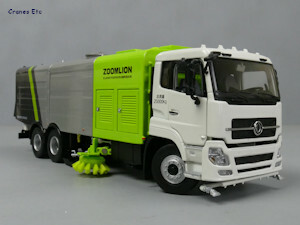 There is no information about the real truck. 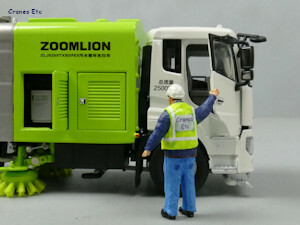 The model is in the unusual scale of 1:38. 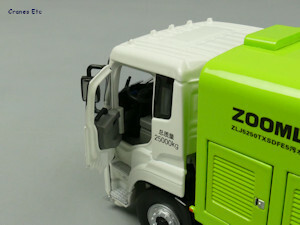 The truck chassis is based on a Dongfeng chassis and the model is detailed underneath, with a number of parts modelled in plastic. This includes the front sprayers, the brush assemblies and two exhausts. 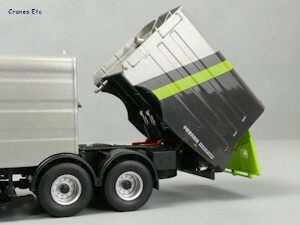 The wheels are nicely detailed, and the tyres are the same on all axles. The cab bears the Dongfeng badge on the nicely detailed grille. The lights are good and there is nice silver highlighting of the roof lights. The interior detail is fine, with a detailed console. There is no number plate as this is a generic model. The sweeper engine bay has doors with detailed grilles, and the vacuum bay has nicely formed hatches on the roof. Underneath, the brushes have plastic bristles and the connections have silver rivets. The vacuum assembly has a number of plastic parts. The hopper bay continues the really good shaping and paintwork of the vacuum bay, and small sharp graphics add to the detail. At the back there are large diversion sign arrows and there is a small spy window into the hopper which is see-through. The front axle has a moderate shallow steering angle, and there is also a linkage through into the steering wheel in the cab which turns a little. The rear axles have sprung suspension. They are also connected to drive shafts which rotate impressively when the wheels are turned. 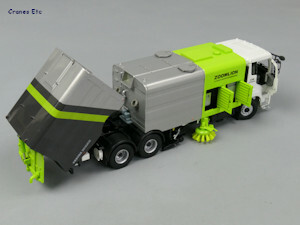 The sweeper brushes can be angled out when in service and they can be rotated by hand. The vacuum assembly can be raised and lowered. The cab doors open and close. 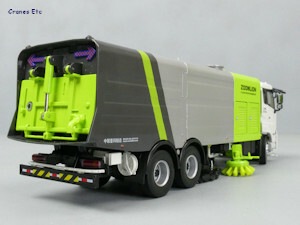 The cab tilts and can be posed tilted. 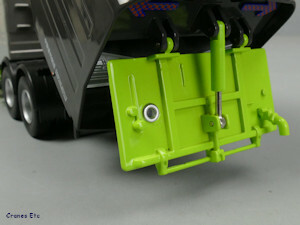 There are two opening panels on each side of the sweeper engine bay. The rear flap on the hopper opens and the whole hopper can be tipped with the rams holding any pose. Safety bars can be raised to maintain the hopper in a tipped position. It has a high metal content with some plastic used, mainly on the chassis. The quality level is very good. The paintwork and graphics are excellent. 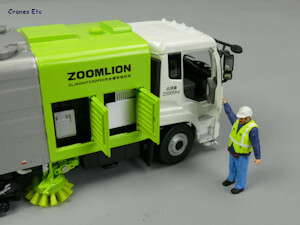 This is a really nice model of a Zoomlion sweeper. 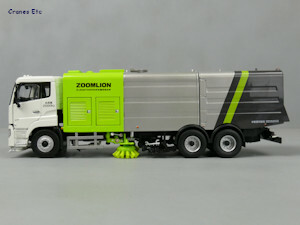 It has really good detailing and an outstanding array of working features which make full use of the opportunity provided by 1:38 scale. 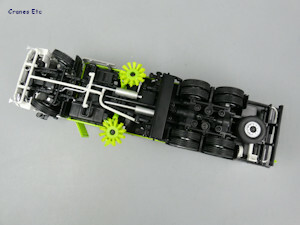 Detailed chassis with working drive shafts. Spy hole can be seen through. Good for team members of the right size.